Arriving at this property nestled in the Diamante Del Lago gated community, the landscaping, architecture, and plantation shutters will definitely impress. This 2 bed, 2.5 bath, 2 car garage home also includes a Honeywell Tuxedo alarm system and is a phone-controlled Smart House. Upon entering, you'll be struck by the granite eat-in kitchen with gas stove top, natural gas fireplace, and Master with 2 closets, as well as the Pella triple pane sliders with blinds installed in 2017. 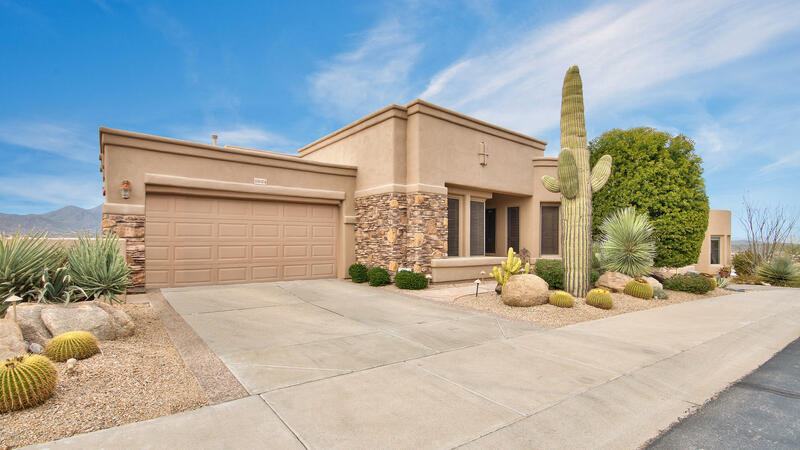 Take a look outside and take in the 4 person spa, new extended patio with mountain and city light views, and outdoor fire pit and bar; the outdoor kitchen includes a grill, refrigerator, sink, and plenty of storage so you can fully enjoy the entertaining you'll do in your new dream home.